1997 Amada PEGA-345 mdl. 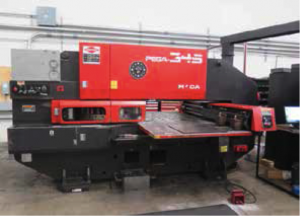 PEGA304050 30-Ton 58-Station CNC Turret Punch Press s/n AQ450294 w/ Amada O4P-C Controls, 58-Station Turret, (2) Indexable Tool Stations, Punch Die Extractor, Auto Sheet Repositioner, 39 ½” x 107” Ball Top Table. Pacific J110-10 110 Ton x 10’ CNC Hydraulic Press Brake s/n A654 w/ Hurco Autobend 5C Controls and Back Gage, 73-Ton Punch Cap., 3/16” MS.PL x 9’, 10’ x 8” Wide Die Base, 7 3/8” Throat, 102” Between Uprights, Fine Tilt Adjustment. Wysong MHT60-96 60-Ton x 8’ CNC Press Brake s/n MT3-116 w/ Hurco Autobend 7 Controls and Back Gage, 6” Stroke, 6” Throat, 96” Bed Length, 78” Between Uprights, 15” Max Die Space. Cincinnati 2CC10 ¼” x 10’ Power Shear s/n 46061 w/ Cincinnati Digital Controls and Power Back Gage, 130” Squaring Arm, 35” Front Material Supports. Amada CSW-220 Hydraulic Corner Notcher / Edge Notcher s/n 561187 w/ 8 5/8” x 8 5/8” Corner Notching Head and Fence System, 2” x 4” Edge Notching Head, 17” x 37 ¾” Edge Notching Table and Fence System. Roper Whitney Mechanical Punch Press w/ 24” Throat. Kenco mdl. 12-113 OBI Punch Press s/n L-103- 666 w/ 10” x 14” Bolster Area. Niagara 28” Hand Roll w/ 2” Rolls and Stand. Bridgeport Series 1 – 2Hp Vertical Mill s/n 233684 w/ Sony Millman DRO, Mitutoyo Digital “Z” Scale,Chrome Ways, Power “X” and Knee Feeds, 9” x 42” Table. Doringer D-350 Miter Cold Saw s/n 18416 w/ 2-Speeds, Pneumatic Clamping, Secondary Speed Clamping Accessory, Work Stop, Conveyors, Coolant. Falls Products “D-BUR- R” mdl. 131 Edge Deburring Machine s/n 3528. Timesavers mdl. 137-1 HDM 36” Speedbelt Grainer s/n 11460 w/ 36” Belt Feed, Barrel Style Dust Collector. Amada FEG 160C Punch and Die Grinder w/ 6 ½” 3-Jaw Chuck, Coolant. Gallant mdl. 1 Dual 3” Belt Sander w/ 7.5Hp Motor. Burr Bench Media Tumbler w/ 16” x 20” Tub. (2004) Curtis KS20 20Hp Rotary Screw Air Compressor s/n 55922 w/ Digital Controls, 78 CFM @ 125PSIG. FS Curtis mdl. RNP100 Refrigerated Air Dryer s/n HG100A1151310031. (2016) 120 Gallon Air Storage Tank. Miller Dynasty 210 Arc Welding Power Source w/ Miller Coolmate 1.3 Cooling System, Cart. Miller Dynasty 200 DX Arc Welding Power Source s/n ME460785L w/ Miller Coolmate-1 Cooling System,Cart. (2) Miller Millermatic 212 Auto-Set Arc Welding Power Source and Wire Feeders s/n’s MG030180N,MG030107N. Miller Millermatic 211 Auto-Set Arc Welding Power Source and Wire Feeder s/n G351237N. Lincoln Precision TIG 185 AC/DC TIG Welding Power Source s/n U1040104916. Miller Spectrum 625 X-Treme Plasma Cutting System. 48” x 96” Steel Welding Table. (2) 42” x 84” Steel Welding Tables. (2) Lista 8-Drawer Tooling Cabinets w/ Punch Die Tooling. (6) Racks w/ Punch Die Tooling. Press Brake Dies and Racks. Nissan KCPH02A25PV 5000 Lb Cap LPG Forklift s/n KCPH02P904507 w/ 2-Stage Mast, 130” Lift Height, Cushion Tires, 6547 Metered Hours. (2) Cantilever Sheet Stock Racks.